Pennsylvania Angus breeders attended the 2015 Pennsylvania Angus Association Annual Meeting and Banquet, January 11 in Grantville, Pa. 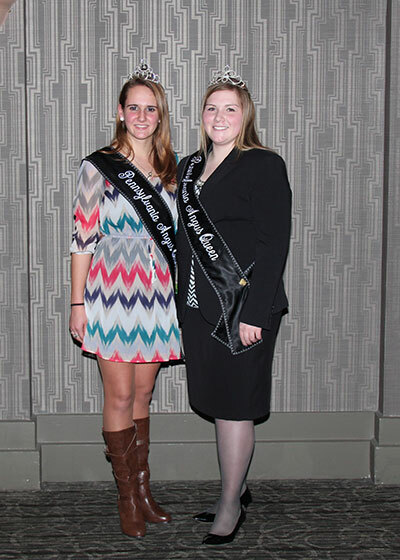 These young ladies were recognized as Pennsylvania Angus Royalty at the 2015 Pennsylvania Angus Association Annual Meeting and Banquet, Jan. 11 in Grantville, PA. Pictured from left are Elizabeth Trowbridge, Meshoppen, 2015 Miss Pennsylvania Angus; and Shelby Dean, New Castle, 2014 Miss Pennsylvania Angus. 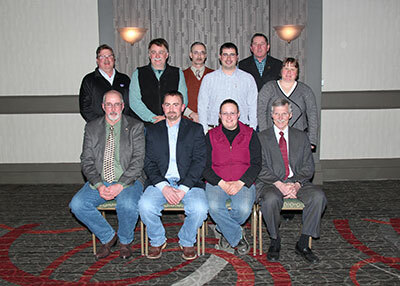 These men and women will serve on the Pennsylvania Angus Association board of directors and are pictured at the 2015 Pennsylvania Angus Association Annual Meeting and Banquet, Jan. 11 in Grantville, PA. Officers seated from left are Eugene Trowbridge, Meshoppen, President; Wendall Landis, Manheim, Vice President; Jamie Brozman, Bethlehem, Secretary; and Bradford Bishard, York, Treasurer. Directors pictured standing from left are Steven Upperman, Chambersburg; Dale Rains, Mercer; Tim Spangler, Boswell; Deric Horting, Newport; Dennis Byrne, Nottingham; and Mindy Seese, Stroudsburg. 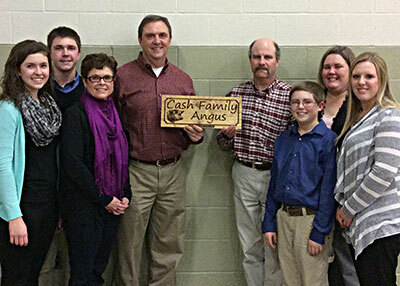 The Cash Family, York, were named Family of the Year at the 2015 Pennsylvania Angus Association Annual Meeting and Banquet, Jan. 11 in Grantville, PA. Pictured from left are Alexis, Grant, Jamie and Chad Cash, recipients; and Brad, Clay, Theresa and Kayce Myers, recipients of the 2014 Family of the Year award. 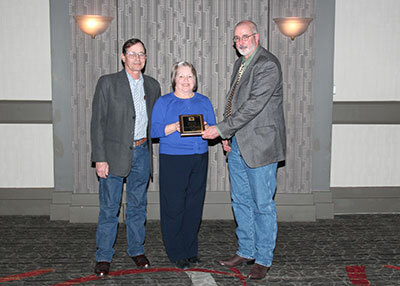 Salansky Angus, Coal Center, was named Promoter of the Year at the 2015 Pennsylvania Angus Association Annual Meeting and Banquet, Jan. 11 in Grantville, PA. Pictured from left are Paul and Janice Salansky, recipients; and Eugene Trowbridge, Pennsylvania Angus Association President. 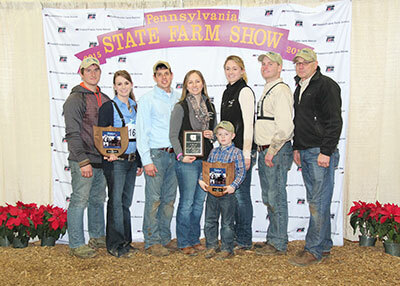 Beaver Creek Angus, Thomasville, was named Seedstock Producer of the Year at the 2015 Pennsylvania Angus Association Annual Meeting and Banquet, Jan. 11 in Grantville, PA. Pictured from left are Jared Miller and Hannah, Denton, Casey, Kolton, Kait, Kyle and Greg Grim. 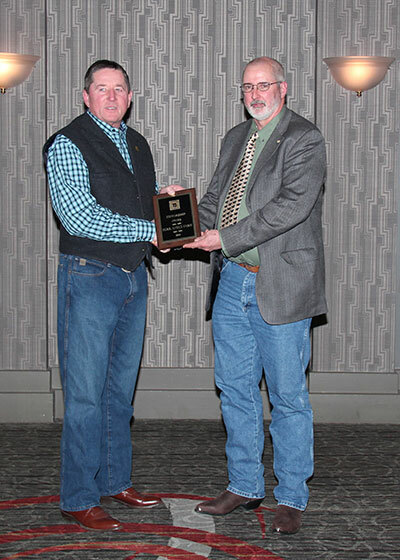 Herr Angus Farm, Nottingham, received the Stewardship Award at the 2015 Pennsylvania Angus Association Annual Meeting and Banquet, Jan. 11 in Grantville, PA. Pictured from left are Dennis Byrne, recipient, and Eugene Trowbridge, Pennsylvania Angus Association President, presenting the award. 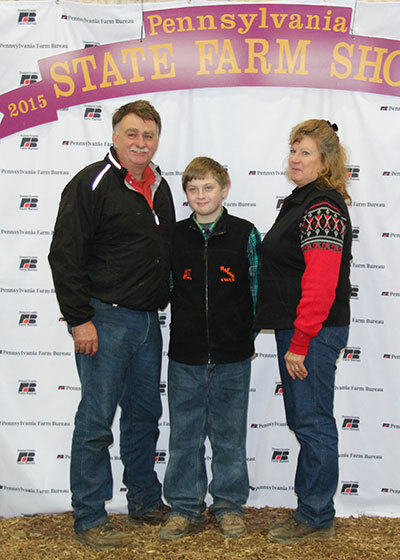 Rains Angus, Mercer, was named Breeder of the Year at the 2015 Pennsylvania Angus Association Annual Meeting and Banquet, Jan. 11 in Grantville, PA. Pictured from left are Dale, Brenda and Chance Rains. 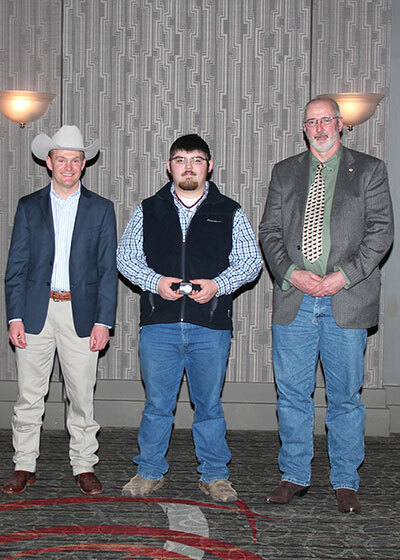 Eric Shoop, Dalmatia, center, received his Silver Award at the 2015 Pennsylvania Angus Association Annual Meeting and Banquet, Jan. 11 in Grantville, PA. The Silver Award is the second level of the National Junior Angus Association (NJAA) Recognition Program. Juniors must apply for the award and then meet point requirements in many areas of participation before receiving the award. Presenting the award are Chris Jeffcoat, American Angus Association Regional Manager, left; and Eugene Trowbridge, Pennsylvania Angus Association President, right.